Salisbury Falls is an absolute must do for anyone visiting Golden Bay. 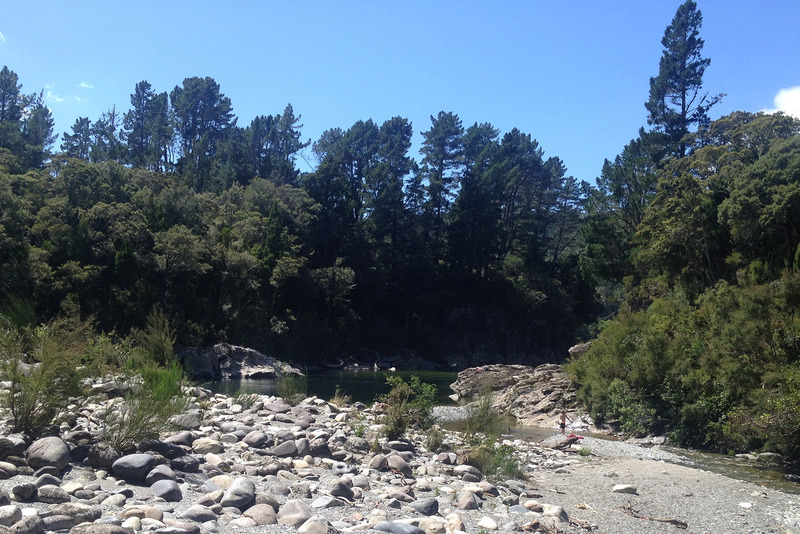 It is an amazing stunning swimming hole in the Aorere River only 30 minutes from Collingwood Township heading towards The Heaphy Track. There is a small waterfall that you can climb up the rocks to and sit in behind the falls, looking down on the deep green swimming hole. Just down from the falls is the main Aorere River which is a deep and slow flowing part of this river and is another great place to swim or sunbath on the rocks. The original Salisbury suspension bridge was built in 1887 and was used by people working and living on the Quartz Range. Eventually a road bridge was built in 1982, but only to be swept away in a flood 3 years later. They built a replacement bridge shortly after, however the original swing bridge was destroyed in a flood in December of 2010. 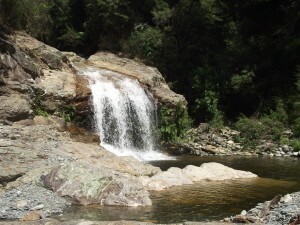 The site is still well worth a visit though as the area is naturally stunning with a beautiful waterfall and swimming hole. The drive is 30 minutes past Collingwood towards Bainham with parking is on the side of the road where there is an informative historical plaque. From there it is a gentle 5 minute walk through a paddock towards the river and falls. Stopping at the Langford Store along the way is definitely worth your while to be immersed somewhere back in time while you sip on a lovely cup of tea or coffee and enjoy home-made sweet treats. The Naked Possum is also worth a stop on the way back to Collingwood as we think it is a must do destination, experience their award winning café, complete with large outdoor fire, spit roast and barbeque.